There is not a much more calm a place for me than to sit in a flowering garden on a bench – peaceful, tranquil and quiet generally. 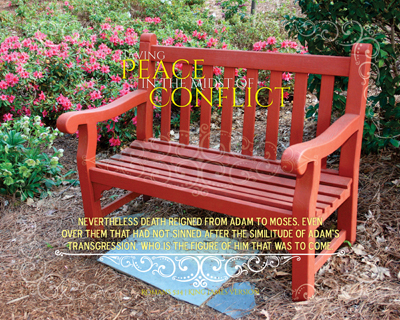 The passage that this verse is a part of is Romans 5, which for the Believer can look into to see a “peace” more bountiful than any flowering garden bench will ever be – for the Lord Jesus Christ is being foretold. In the middle of all the chaos that seems to happen all around us, we can rest certain that the God of All Creation has it under control and is not caught off guard in any event or action. Will we rest in Him? Have found that the closer I am to Him, the calmer everything is – like the garden bench depicts for us in a manner of speaking. This image is one of 19 total images in this Series.